Steelmaster Key Cabinet - 240-Key Capacity - 240-key steel cabinet keeps track of your "loaner" keys and organizes your business. Ideal for offices, rental management companies, and truck and auto rental companies. Simply attach keys to the numbered key tags (included) and file on the key racks slots. When a key is loaned, an "Out Key" control tag (recording the key number, key recipient and date) is filled out and placed in the same spot as the loaned key. For additional accountability, a record chart can also be filled out. 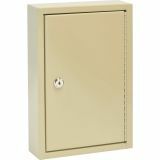 SteelMaster UniTag Key Cabinet is made of durable heavy-gauge steel with a chip-resistant and scratch-resistant pearl finish. Full piano-length hinge allows you to open the cabinet fully and view all keys. 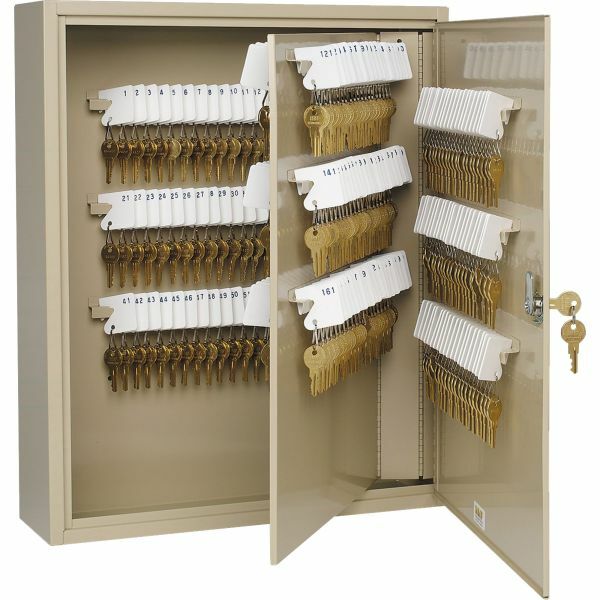 A door-mounted, single-key lock secures the cabinet. Predrilled holes and mounting hardware allow easy installation. Locking door includes standard disc tumble keylock with two keys.